Design your stream with a browser based studio editor, invite guests, then broadcast to popular platforms. No software, extra time or technical knowledge required. Turn your single camera look into one that stands out. Create designs from scratch or ready-made templates. Design with a web based drag-and-drop editor and add elements such as text, images, webcams, shapes and other video production elements. Go Solo, or Invite participants and guests to join in the broadcast with their camera from either desktop or mobile. Go Live to existing audiences on platforms such as Facebook Live, Youtube, and Twitter where your followers can view, interact and share your live or archived content. Choose from a variety of professional pre-designed templates. Customize them to your liking and go live in seconds. Invite users on the system or guests to your production to collaborate in realtime. Give users different roles to manage, design, and produce. Switch to different scenes and produce the show on-the-fly from anywhere. Manage and moderate participants. Share your productions and creations with others. Give them away or sell them directly or through ViewJoins marketplace. Customize your production with dynamic elements that provide the functionality of modern broadcasts. Take your creativity to infinite possibilities by leveraging our API where you can dynamically control and automate all aspects of the production lifecycle. 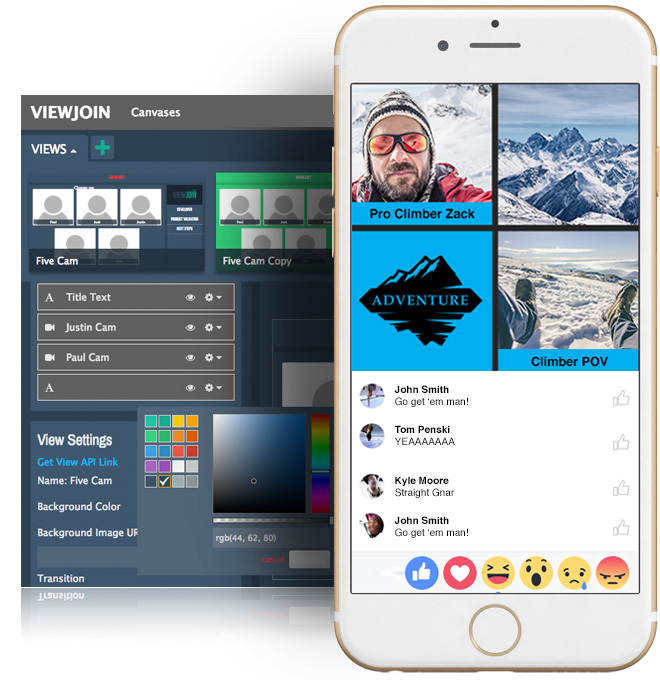 ViewJoin is an end-to-end broadcasting platform in the cloud that empowers anyone to easily create professional live video. With our intuitive drag-and-drop studio you can produce compelling live content without expensive software, excessive time and technical knowledge. We would love to hear from you. Please fill out the form below and we will be in touch as soon as possible.